St. Clairsville, OH (February 27, 2018) — More than 115 students from four local high schools competed in the 2018 Tests of Engineering Aptitude, Mathematics, and Science (TEAMS) regional competition at Belmont College on Friday, February 23 in St. Clairsville, Ohio. Students from the following high schools participated: Bridgeport, Shadyside, St. Clairsville, and Wheeling Park. 11th -12th Grade Varsity winners Wheeling Park High School Team A (seated left to right): Morgan Glass; Sarah Ihlenfeld; Allison Holmstrand; Bria Spigarelli; (Standing left to right): Alex Dague; George Maness; Team Coach, Kevin Orth; Lillian Bischof; and Fiona Zhang. This event is sponsored nationally by the non-profit Technology Student Association (TSA). The TEAMS competition involves a two-hour written exam where students work in groups of six to eight. The students use their math and science skills to solve real-world engineering challenges in applied science and technology, including: architectural, biomedical, computer technology, fire-protection, mining, telecommunications, transportation or wireless technologies. Additionally, as a portion of their Part II test, students had to design and build a tower out of pipe cleaners and straws that would support a tennis ball. Winners at the regional level will advance to the state level. All schools will have their Part II tests graded by TSA and may be considered for national recognition based on their Part I and II scores. National winners will be announced in March. 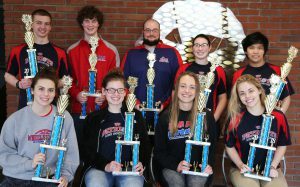 First place: Wheeling Park High School Team A – Lydia Bischof; Emily Croft; Leah Gaudino; William Haller; Emma Ihlenfeld; Luke Mazura; Marian Moss; and Slater Shelek. Coached by Kevin Orth. Second place: St. Clairsville High School Team A – Madison Dagan; Hannah Elerick; Chase Green; Jared Jackson; Matt Marling; Sydney Porter; Brett Ulla; and Joseph Wissmann. Coached by Heidi Magnone. Third place: Wheeling Park High School Team B – Michael Castellocci; Josh Farmer; Alyssa Foster; Sidney Gebhardt; Andrew Glass; Jonah Henthorne; Robert Miller II; and Jett Thomas. Coached by Kevin Orth. First place: Wheeling Park High School Team A – Lillian Bischof; Alex Dague; Morgan Glass; Allison Holmstrand; Sarah Ihlenfeld; George Maness; Bria Spigarelli; and Fiona Zhang. Second place: Wheeling Park High School Team B – Kelsey Chacalos; Deanna Crumm; Marguerite Demasi; Abby Jones; Justin Levelle; Ashley Linder; Perry Maness; and Nate Mountford. Coached Kevin Orth. Third place: Shadyside High School Team A – Briana Crippen; Ryan Faith; Sophia Ferrelli; Tyler Hostuttler; Mackenzie Osman; Kayla Smith; and Jacob Thornburg. Coached by Vince Thornburg. Belmont College staff and faculty coordinated the TEAMS event and administered the tests. TEAMS works to increase interest and awareness of engineering and technology-based careers with student competitions, assessment tools, career guidance resources, and more, along with resource materials for parents and counselors. TEAMS programs excite high school students about careers in engineering and related technical fields and help them understand the critical role engineers play in the world around us.